A friend lent me the antique tool shown in these photos. I’d been thinking about renting a rototiller to prepare three garden beds, but this thing tore through them way more easily than I could have done with a shovel, rake, hoe, or garden weasel. It’s really good at clawing up major weeds and clumps of sod. Our question: What is this thing called? I looked through the catalog at antiquefarmtools.info. It’s full of beet shovels, muck rakes, turnip grubbers, and barley forks, but I didn’t find anything that looks like this artfully blacksmithed and wickedly effective tool. I’ll try and take a stab at it. It’s a variation on a potato cultivator. Only instead of dragging it behind a big iron wheel and pusshing it with two handles, this one is mounted as a hand tool instead. It’s got the spade ends like your modern day potato cultivator. Just a long handled cultivator. I have a couple, not antiques. I guess it’s supposed to be a cross between a rake, a fork, and a hoe. I don’t find them that useful for much, except for sometimes working in compost to soil to the depth of the cultivator, but that’s only about 6″ or so. And a regular garden fork and/or spade is better for deep aerating/loosening/mixing IMO. I would have called this a ‘hand harrow’ on the farm (in Scotland) where I grew up. I guess “hand cultivator” or “hand harrow” are the right terms. The modern incarnations don’t seem to be as fierce as this vintage model, though, do they? I’m wanting to sell the one I have. Since it’s antique do you have any idea what price to ask? I just got one at an estate auction for $7 with a pitchfork and pickaxe included. 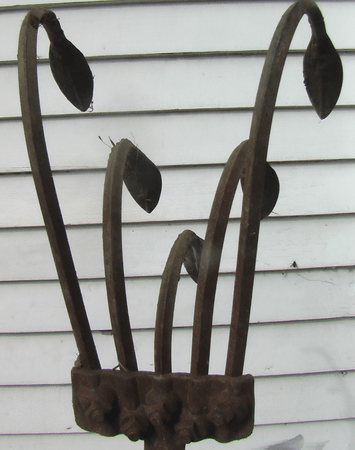 I think it is probably much more valuable as a garden tool than as an antique. It works great even in muddy soil! I’ve got it’s twin, but never knew what is was called. Passed down from my grandfather. Great tool, great work-out. I grew up on the Nebraska prairielands during the mid-20th century (yikes! sounds like ancient history), where it was call a hand harrow. Awesome! I need to put that on a little sign next to a gargoyle in my garden. I’m experiencing problems with seeing your site clearly in the latest release of Opera. Looks good in Explorer 7 and Firefox however.Hope you have a nice day. Whatever is the name of this vintage sort of tool but it is quite helpful for tinny level gardening, I am going to meet a black smith near by to have a tool like this for me , will be here again to view your new post. Great read. Thanks – from an antique phone enthusiast. That thing looks almost evil lol. You know the old garden tools would last hundreds of years and the junk we get nowadays has to be replaced all the time. Hi. The tool looks really evil. I would call it ” The EVIL HARROW”… The creator must be design specific, I mean look at the design. 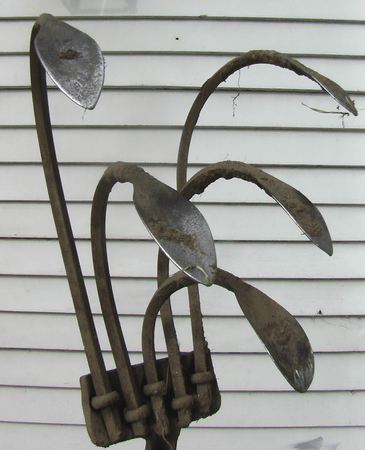 Its rare to see artistic gardening tools. Enjoy farming with your evil harrow.. You can auction it later..lolz. Does anyone know If there’s a value to a vintage Empire 24″ hi-wheel cultivator push plow? Your tool is one of a number of adjustable 5-tine cultivators manufactured from the mid 19th century through the present. While it may have many local/regional names, it has two that generally apply and have persisted over the years. The older name was “Chameleon Cultivator” referring to the ability to perform as a single, double, triple, quadruple or five-tined cultivator by removing one or several tines. In one-tine configuration it was used to till and weed in narrow spaces. With two narrow or wide spaced tines, or with only the middle tine removed, it was used for over-row work, straddling young plants and tilling on both sides. 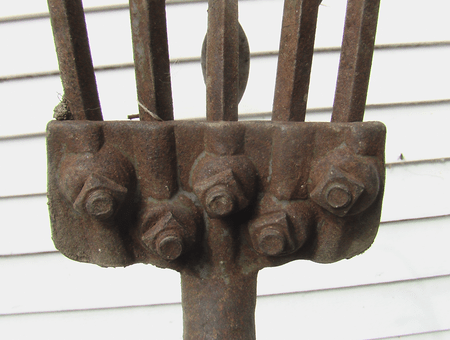 The middle three tines were commonly used in small vegetable gardens with closely spaced rows. The full, five tine setup was used between rows in large vegetable gardens. It was a popular tool with both home gardeners and smallholder market gardeners. 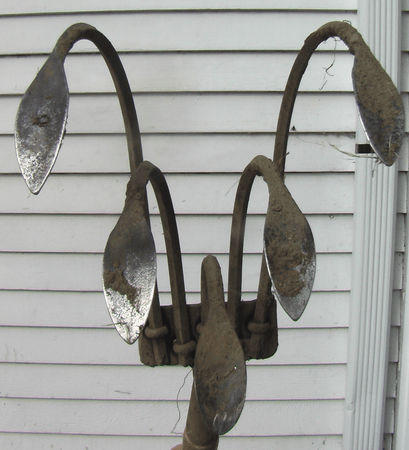 During World War II it was called a “Victory Cultivator” and was part of government programs to promote home gardening. Both True Temper and Norcross were significant manufacturers of this tool and the tool was sometimes known by the latter name. Today the tool is produced in both India and China and, insofar as I know, by Johann Offner in Austria. Until a few years ago, Ames imported the tool from Offner. Since they dropped it, no one isbringing the tool into the United States Wolfgarten made a similar tool, with the tines removable in pairs, and may still. Just bought one just like in the picture for 2 bucks at a local thrift store.